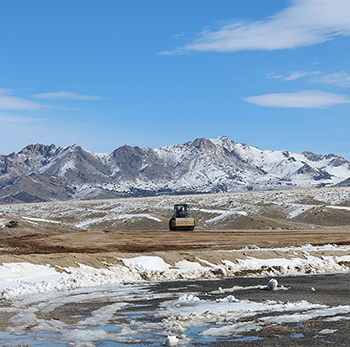 The snow is receding and the drilling of two new monitor wells for the Utah FORGE laboratory starts this week. The first well is being drilled to 1000’ and the second well will go to 3000’. Both are situated near the existing deep well, 58-32, that was completed in 2017. The new wells being much shallower, should be completed by early April, when they will be instrumented with state of the art sensors. 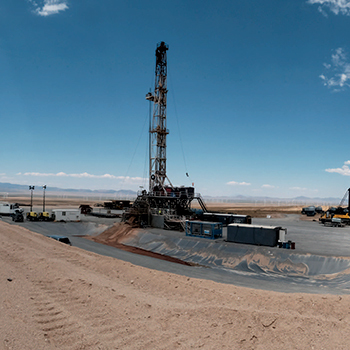 During the drilling process, geologists and engineers will be on site, in order to provide important information about rock types and shallow groundwater resources. convening of the Science & Technology Analysis Team (STAT). 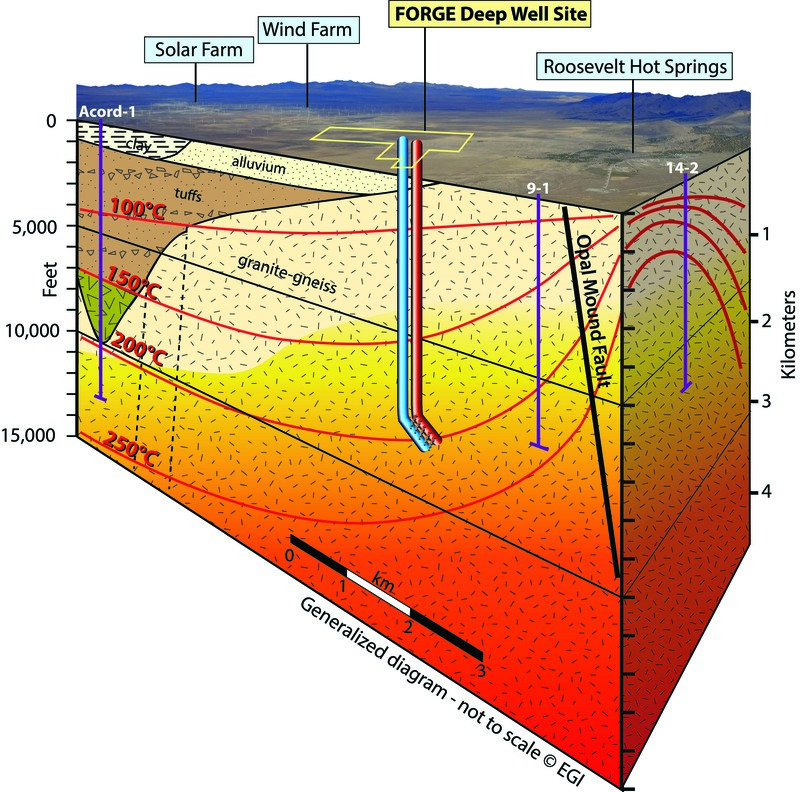 Following a three-year, five-way competitive process, the U.S. Department of Energy has selected the Energy and Geosciences Institute (EGI) at the University of Utah to develop a geothermal laboratory near Milford, Utah. 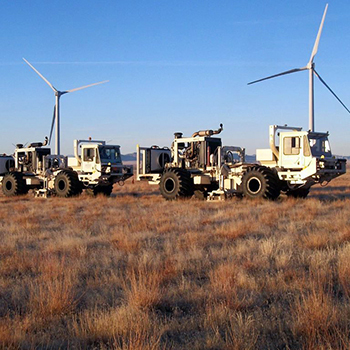 The laboratory, called Frontier Observatory for Research in Geothermal Energy (FORGE) will focus on developing enhanced geothermal systems which could greatly expand the nation’s capacity to produce geothermal energy. The FORGE award will consist of up to $140 million over five years. 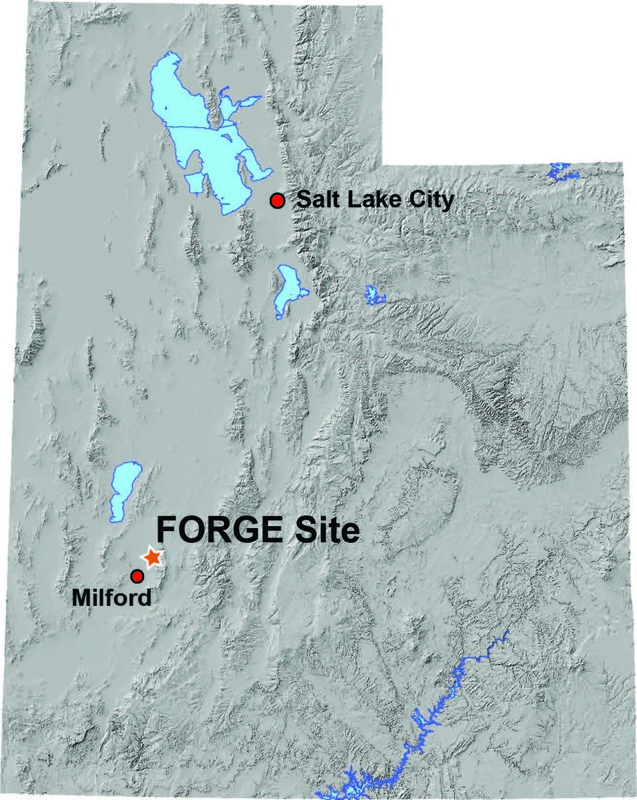 The FORGE project involves drilling two 8,000-ft long wells in an area north of Milford, Beaver County, Utah. Cold water will be pumped into one well and heated by the rocks as it circulates, then will be pumped out of a second well. After the heat is extracted at the surface, the cooled, circulated water will be cycled back into the first well. The laboratory will use non-potable groundwater that cannot be used for agriculture or human consumption. Currently, geothermal power plants need two things: hot rocks at depth, which can be found practically anywhere on the planet, and hot groundwater that can be extracted at the surface. Enhanced geothermal systems like FORGE could create their own hot groundwater, making it possible to place a geothermal power plant nearly anywhere. Read the U.S. Department of Energy press release here. Read the release from the Governor’s Office of Energy Development here. Find U.S. Senator Orrin Hatch’s statement here. Read more about the project at forgeutah.com or here. Salt Lake City Tribune Article. NPR All Things Considered special on the FORGE project entitled 'The Forgotten Renewable: Geothermal Energy Production Heats Up'. Three and a half hours east of Los Angeles lies the Salton Sea, a manmade oasis in the heart of the Mojave Desert. It was created in 1905, when a canal broke and the Colorado River flooded the desert for more than a year. The Sea became a tourist hotspot in the 1950's, perfect for swimming, boating, and kayaking. But now, people are coming here looking for something else. Jim Turner is the chief operating officer of Controlled Thermal Resources, an energy company from Australia. 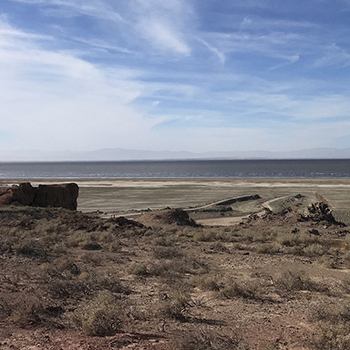 On a hill overlooking the Salton Sea, he points out a patch of land that will someday house his company's first power plant, named Hell's Kitchen. "We're standing on top of what is probably the most robust geothermal resource in the United States," he explains. Geothermal energy uses the earth's natural heat to create electricity. While there are several different ways to accomplish this, the most common is to take super-heated water from geothermal hot spots and pipe it to the surface. It then turns into steam and spins a turbine, which generates electricity. It's completely renewable, and generates clean energy around the clock, unlike wind and solar. "You think of renewable energy as a house, solar is the roof and the wind is the walls," says Jason Czapla, principal engineer for Controlled Thermal Resources. "But geothermal's the foundation, and what California did is it built the walls and the roof, but on wild, windy days it blows too much rain on the roof [and] that house falls down. Well, the Salton Sea is this opportunity for California to fix that." The company wants to develop 1,000 megawatts of electricity here over the next decade. They say that could power about 800,000 homes. And for a state that's aiming to get half its electricity from renewable sources, that's no small number. "Our development coincides with the state's target, 2030 being the ultimate goal getting to 50 percent," says Czapla. "And our goal is to build up that 1,000 megawatts and help them increase the renewable energy portfolio." To read the full NPR story, click here. More information is also found on this page of the UGS Blog. Watch this youtube video to see how it's done.